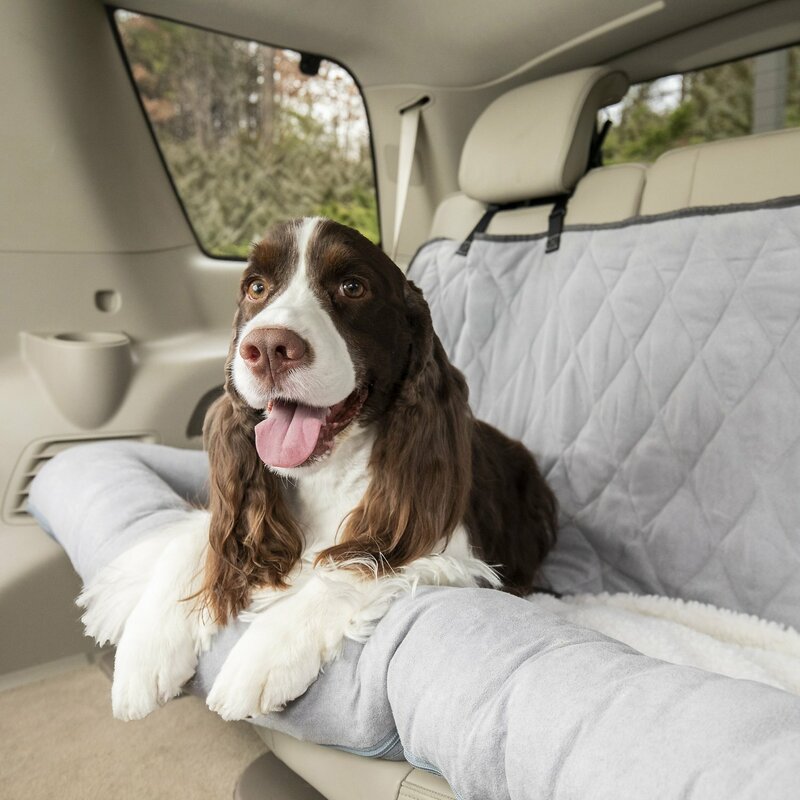 Turn your car’s seat into a comfy pet bed with Solvit Car Seat Cuddler, the quintessential car bed for pups or cats on the go. 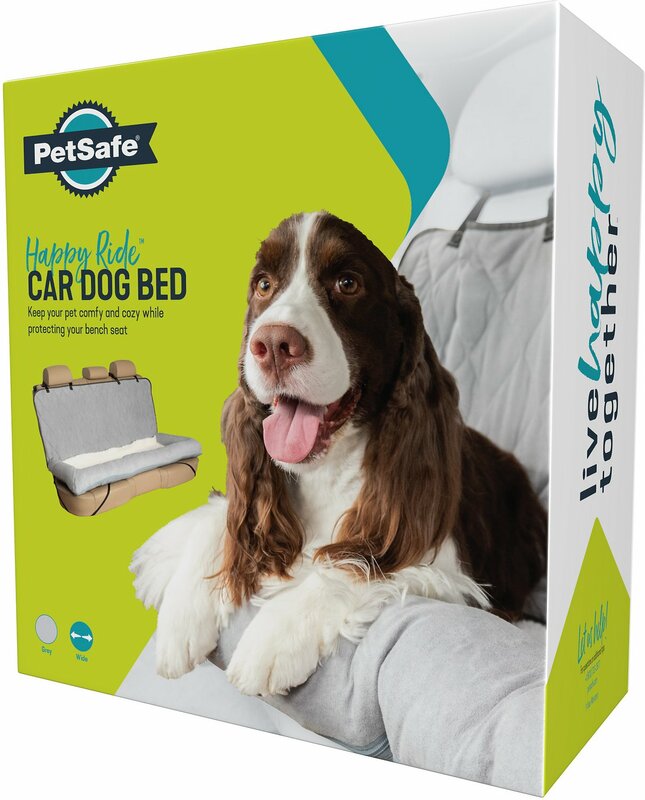 It’s fitted for your car seats and boasts a plush central bed section with generous side bolsters to ensure a cozy ride for your pampered pet. Constructed from micro-suede fabric and faux sheepskin, with a polyester fill that keeps your best friend comfy and cozy while protecting your seat. Small size is perfect for a bucket seat or a portion of a bench seat, and fits a pet up to 30 pounds, while the large size is great for the entire bench seat, comfortably fitting pets over 30 pounds or multiple pets. It’s even machine washable for easy cleaning. This ultra-comfortable automobile booster-style pet seat is made to fit most standard cars. Features a plush central bed section with generous side bolsters to ensure the most cozy ride your pup has ever taken. Constructed from micro-suede fabric and faux sheepskin, with a polyester fill. Protects your car seats while providing an exceptionally comfortable ride for your dog clean. Cleaning: Promptly wipe up any foreign matter or standing liquid. Machine wash cover in a commercial size front-load washing machine. Before washing, remove the U-shaped bolster filling, as discussed in the first paragraph above. Use cold water with a mild detergent. Line dry. Always make sure the Cuddler and vehicle seat are dry before re-installing. Installation in car: Place the Cuddler on the car seat and loop the headrest strap over the headrest and adjust for best fit. Locate the white plastic tube sewn to the underside of the Cuddler. Push the tube into the gap between the seat back cushion and seat bottom cushion. The tube can be removed with a strong tug, but will hold firmly enough to keep the Cuddler in place under normal use. Find the strap sewn to the underside of the Cuddler and pass this under one of the front corners of the seat and connect to one of the plastic adjustable anchors found on the sides of the Cuddler (use of this is optional and might not work on some floor-mounted car seats). The vehicle seat belt can now be buckled over the top of the Cuddler. For your pet’s comfort, the lap section of the seat belt can be covered by the fabric panel on the edge of the Cuddler’s central bed section. With the seat belt connected, your pet can now be safely restrained using one of Solvit’s Car Safety Harnesses (sold separately). Use of the safety harness is optional, but recommended to improve safety for pets and passengers. I really wanted to love this car seat, but despite installing it per the instructions, it slides around too much. Also, it does not come with a harness! When I purchased it, I didn’t realize that the harness is a separate purchase. That is ridiculous!! So, while the car seat is a nice cozy spot for my dog in the car, (she does enjoy sitting in it), it doesn’t provide any real safety and is essentially useless. This seems to be a well made product. However, I should have listened to the reviews that stated product doesn't fit or secure well. The car seat will not stay in place at all in my SUV. One strap under the front corner is not sufficient. Attempting to feed the seatbelt strap through the 2 slots just causes the entire car seat to bunch up. I will likely just use it as a dog bed somewhere, but not as a car seat. My 5 month old Frenchie loves this car seat. He feels nice and secure and loves resting his head on the side. It's easy to setup and take out of the car. When I go to friend's houses, I will even take it off and fold under the back part and he goes right to sleep in it. Great purchase, would highly recommend. I bought this in the large size for the back seat of my Jeep Grand Cherokee for when my 80 lb Golden Retriever is in the car. He loves bolster beds in the house and so this was definitely a good purchase. It was easy to install and fits perfectly in my car. And my dog loves it! This works great. Stays in place and my dog loves it! She can curl up and sleep without feeling like she’s going to fall on the floor. The bolster really makes her feel secure. I also love how quick and easy it is to install or remove. I take my small dog most places with me. I have bucket seats that are a bit slippery for her. If we use a blanket it just bunches up and slides into the crease of the seat. This was not only reasonable priced..its easy to get in and out and store in the trunk or back seat and it keeps her right where she wast to be and no slip sliding around! This car seat is exactly what I was looking for. My fur babies love it. I would recommend it to amyone. It is great quality at a great price..